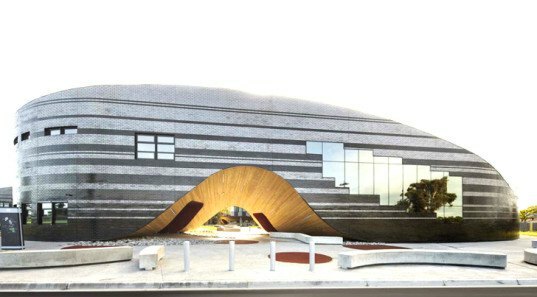 The Infinity Centre designed by McBride Charles Ryan is a futuristic curvaceous library that unifies the Penleigh and Essendon Grammar School campus in Melbourne, Australia. The sleek building was designed with aerodynamic lines to combat the high winds that occur on the school’s site. The infinity-inspired shape creates natural cloisters and meeting places where the students can relax or study outside while being protected from the wind. The Infinity Centre was designed to draw students back to the library by making it the central heart of the campus. Radiating out from the library are two wings that together form protected and private courtyards for students and staff to use. The courtyards create an opportunity for natural light and ventilation to permeate the entire structure, giving an airy feeling inside and out. Related: Rotterdam’s Stepped Central Library Sprouts a Green Roof and a Beehive! The curved undulating archways along the base of the structure seem to raise up from the ground, creating a playful design that doubles as shelter from wind and rain. Each archway is lined with locally recycled timber, tying the campus with the land. Emulating the curvature of the building are a pattern work of glazed bricks arranged in stripes. The glazed bricks also act as a natural insulator for the interior, blocking wind and helping to control temperature. The glazed bricks also visually unify both wings by giving them the same skin. Inside, each school wing is given its own identity with different color schemes, which meet together at the shared central library. 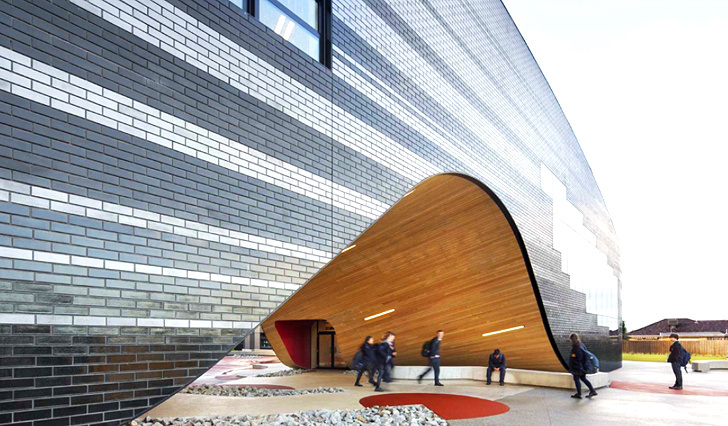 The Infinity Centre creates a modern campus for students to become inspired by as they learn. The courtyards create an opportunity for natural light and ventilation to permeate the entire structure, giving an airy feeling inside and out. The glazed bricks also act as a natural insulator to the inside, blocking wind and helping to control temperature. The glazed bricks also unify both schools, using the same skin. The Infinity Centre was designed to draw students back to the library, as the central heart of the campus. Radiating from the library are two wings that together form protected and private courtyards for students and staff to use. Each archway is lined with locally recycled timber, tying the campus with the land. Emulating the curvature of the building are a pattern work of glazed bricks that are arranged in stripes.